This is my first participation at Daring Bakers Challenge. I have been trying to participate for a long while now but something was pushing me back. 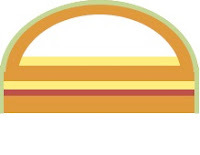 Somewhere in my mind, I had the feeling that Daring Bakers Challenge was attempted by only the genius and the great bloggers and I, a new baker with my new small blog, doesn't fit into the role. But looking at this month's Challenge hosted by Korena from Korena in the Kitchen who challenged everyone to make a Swedish Prinsesstårta, I couldn't help but think why not give this cake a try. And I decided to dedicate this to my Princess, my Sweet little sister Shruti, who celebrated her 24th birthday this month. And to top the happiness, she got selected in her Pre-PG Exam and will now be getting entrance in Collage to be Super Specialized Dentist. 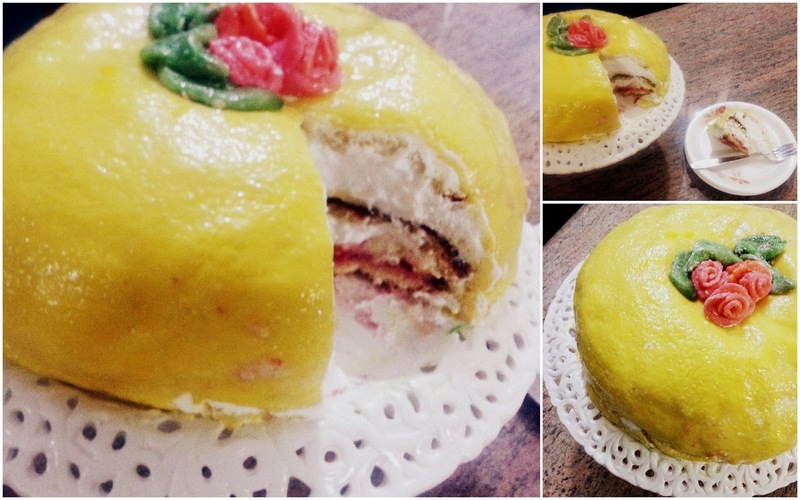 A Princess Cake (Prinsesstårta in Swedish) is a traditional Swedish cake consisting of alternating layers of airy sponge cake, whipped cream, and thick pastry cream, all topped with a 2–3 mm thick layer of marzipan. Although the texture is slightly different, the flavor is very similar to that of angel food cake, and the marzipan and whipped cream (along with the heavy, cream-based frosting) is highly comparable to a buttercream in both texture and flavor. A little research revealed that the original recipe was created in the 1930s by a Swedish home economics teacher named Jenny Åkerström, who taught the three Swedish princesses of the time. She published a series of four cookbooks called “The Princess Cookbooks” and in one of the editions, there was a recipe for “Grön Tårta” (green cake). One story is that this later became known as “princess cake” (Prinsesstårta) because the three princesses are said to have loved it so much. Another story is that Ms. Åkerström actually created three very elaborate “princess cake” recipes – a different one for each princess – and that the current version is a simplified combination of all three. That explains the princess connection, but the reason for the cake being green still seems to be a mystery. Today, Prinsesstårta is popular in Finland as well as Sweden – so much so that the third week in September is officially Prinsesstårta Week! 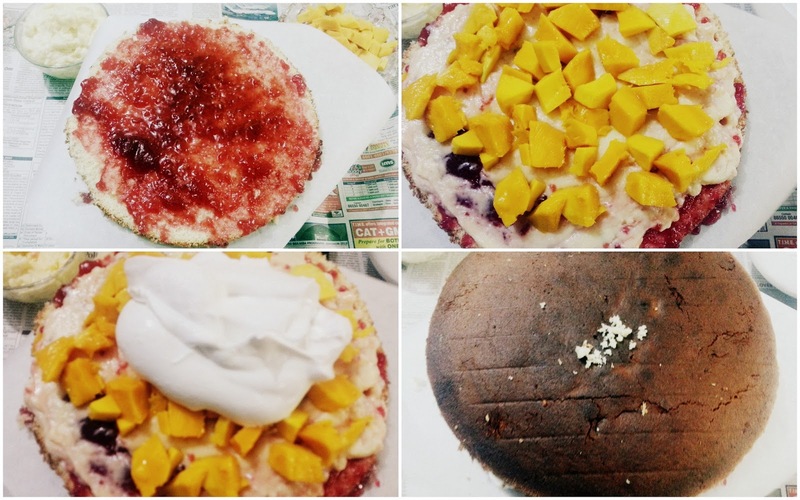 The next day I had someone visiting at home and could not bake another cake until night. Thats when I baked the cake, whipped the cream and tried to assemble the cake in a hot and humid May mid-night and in the room with no Air Conditioner. There were a lot of challenges in finishing this cake but at the end I am glad I could finish it and it tasted awesome! This cake might not be the best looking cake I have ever made but this is definitely one of the best tasting cake that I have made. 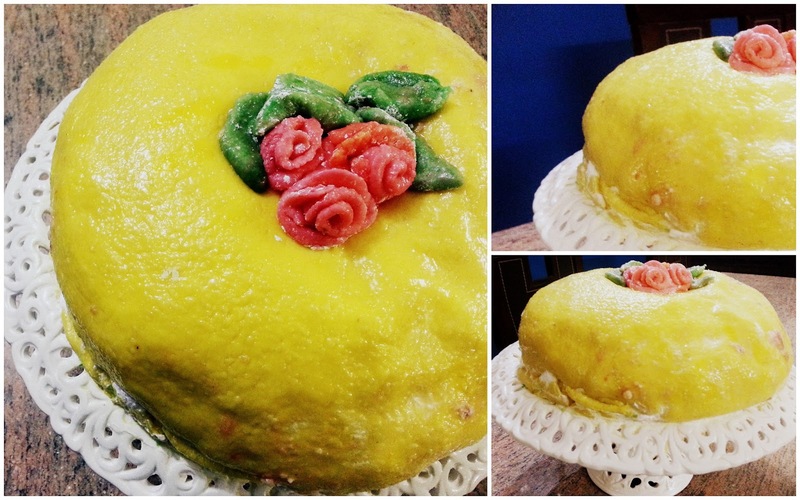 I would like to thank Korena once again for putting up the challenge to make this sweet and beautiful Princess Cake! Preheat the oven to 350°F/180°C. Line the bottom of a 9 inch spring form cake tin with parchment paper then butter the paper and sides of the pan. Dust the buttered pan with bread crumbs to coat the sides and bottom of the pan. Set aside. In the bowl of your stand mixer or hand mixer, place all four eggs and sugar and beat on a medium high speed for about 5 minutes until the eggs tripled in volume, fluffy and light pale yellow in colour. The mixture will fall from the beater in thick ribbon. Add vanilla extract and beat it to incorporate in the egg mixture. In another bowl, sift all the dry ingredients i.e. all purpose flour, corn flour, baking powder and salt and whisk it together. Add the dry ingredients into the egg mixture and fold it in with the help of the rubber spatula by cutting in the centre and folding it in just until the flour is completely incorporated into the batter. Do not over mix the batter. Pour the batter into the prepared cake tin and bake for about 40 minutes. The cake is done when the top of the cake is spongy to the touch and a tooth pick inserted in the center comes out with few moist crumbs. Let the cake cool in the pan for a few minutes then run a knife around the edges and remove the cake from the pan and let it cool completely on a wire rack. Do not worry if the cake sinks a bit from the center. Once cooled completely, cover the cooled cake with a cling film and freeze it in the freezer until further use. In a small bowl whisk the egg yolks and sugar until sugar completely dissolves. Add the corn flour and all purpose flour and whisk it to incorporate in the egg mixture until it becomes a smooth paste. Remove the milk from heat and add slowly in the egg mixture while continuously whisking the egg mixture otherwise the eggs will scramble! Pour the egg mixture back into the bowl which had milk boiling and cook over medium heat until boiling whisking continuously. Once the egg mixture starts to thicken (after 30-40 seconds), remove from heat and quickly add the vanilla extract and stir. Pour the cream into a clean bowl and place a plastic wrap on the top layer of the cream to avoid forming of a skin. Let it cool completely on room temperature. Freeze the cream in the refrigerator for 2-3 days if not using immediately. Stir before using the cream to get rid of any lumps that may have formed. Place the almond flour and icing sugar in the bowl of your food processor and pulse it to remove any lumps that may have formed. Add corn syrup and almond extract and pulse again to combine. The mixture should still be quite dry and crumbly and would not have a doughy consistency. Scrap the mixture onto your kitchen top and knead it to form a dough ball. Wrap the dough with a cling film and rest it in the refrigerator over night to let the flavours merge completely. Whip the cream (I used Rich's non dairy cream) until stiff peaks before assembling the cake. Keep the cream in the refrigerator until use. With a long serrated knife and working very softly, slice the sponge cake into three equal layers. Use a spatula to help you lift out each layer of the sponge cake once you cut it. Set aside the middle layer as this will become the top layer of the cake which will give the cake the dome shape as this layer is most flexible and fragile and very easy to bend. Place the bottom layer of the cake onto the serving plate or cake board and spread the raspberry jam evenly on the layer. Spread the cut mangoes evenly onto the layer of pastry cream and cover the mangoes with a thick layer of whipped cream. Top the whipped cream with another layer of the cake. Spread the remaining pastry cream evenly over it again keeping some space around the edges. 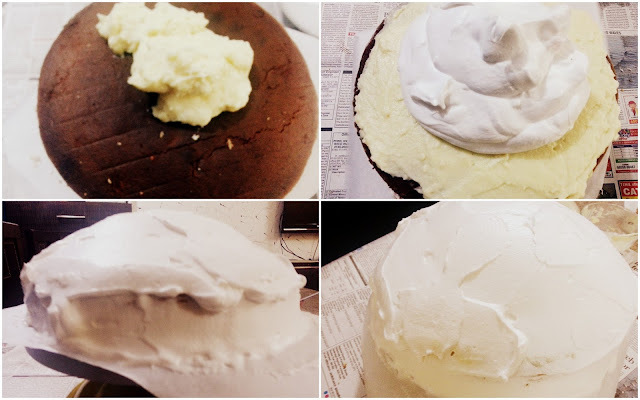 Reserve 1/2 cup of the whipped cream separate and pile the rest of the stiffly whipped cream to make a dome shape covering the sides of the cake. Place the final layer of the sponge cake (the one set aside earlier - the most fragile middle layer) and cover the cake with the remaining whipped cream making the dome look as perfect as you can. 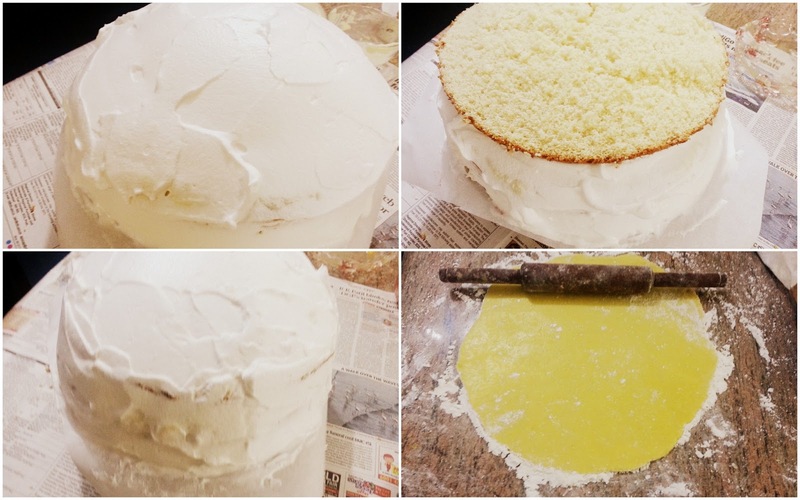 Refrigerate the cake to firm up while you continue with the next step. Considering the hot weather I had kept the cake in the freezer. Colour a small piece from the marzipan into a pink colour to form rose and another small piece into green colour to form leaves. Colour the remaining marzipan with yellow colour. I chose these colour to compliment the season and the mangoes I had put in the cake earlier. Spread the kitchen top and rolling pin with lots of icing sugar or corn flour and press the marzipan into a disc and rolling it out to a 14 inch circle with 1/8 inch thickness. Use plenty of icing sugar on both sides of the marzipan and roll it with your hands to avoid sticking onto the kitchen top. Thankfully, I had worked with a fondant cake earlier which made my job of rolling the marzipan bit easy but the hot weather made this job very tough. 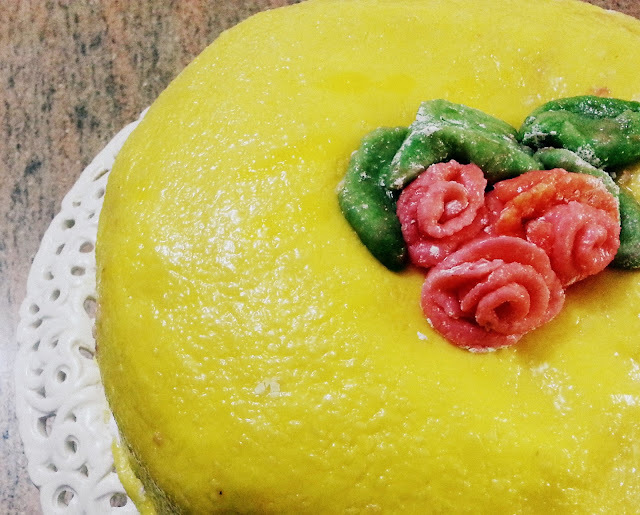 Decorate the top of the cake with marzipan roses and leaves. This one's for you - Shruti! I hope you would also enjoy making this cake as much as I did!